Sorry to have been quiet of late, moving house whilst heavily pregnant has put paid to much crafting. Never one to leave things til the last minute 😉, I began work on this yesterday afternoon. (His nativity was today!) Luckily for me, this was a quick make. I based it on a costume I saw here. Voila! I used a clump of balls at the back, for a tail and left it hung up to dry for a bit. The top took about 20 minutes to make, super quick! 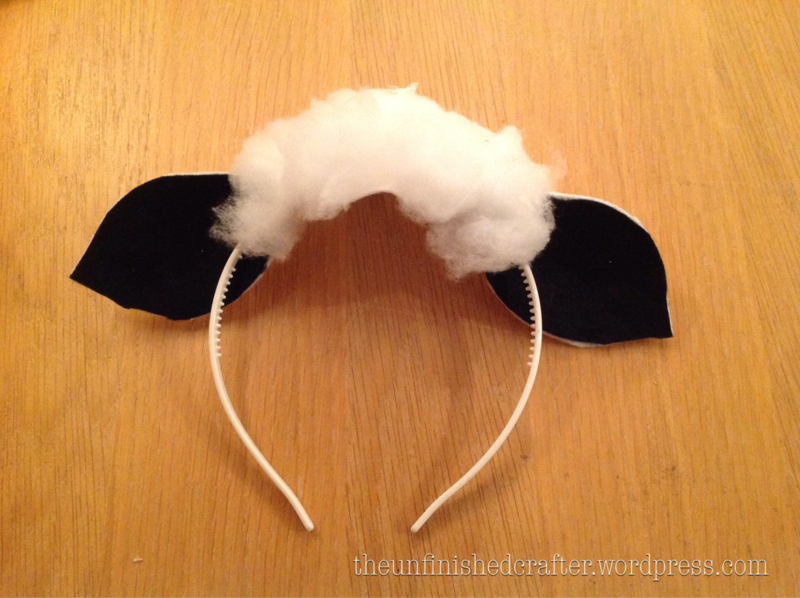 Once Little Man was safely tucked up in bed last night, and I’d reattached some cotton wool balls which had fallen off the top, I set out to make him a sheep headband. Luckily, I happened to have a white alice band, which also fitted his had, so I used that. 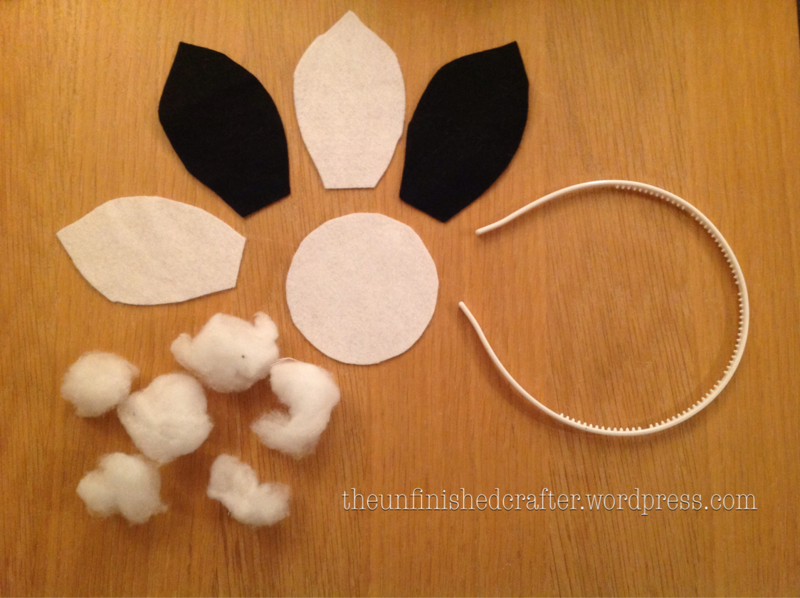 I had some leftover black and white felt, from which I cut out two white ears and two black ears, and a circle of white for the head. 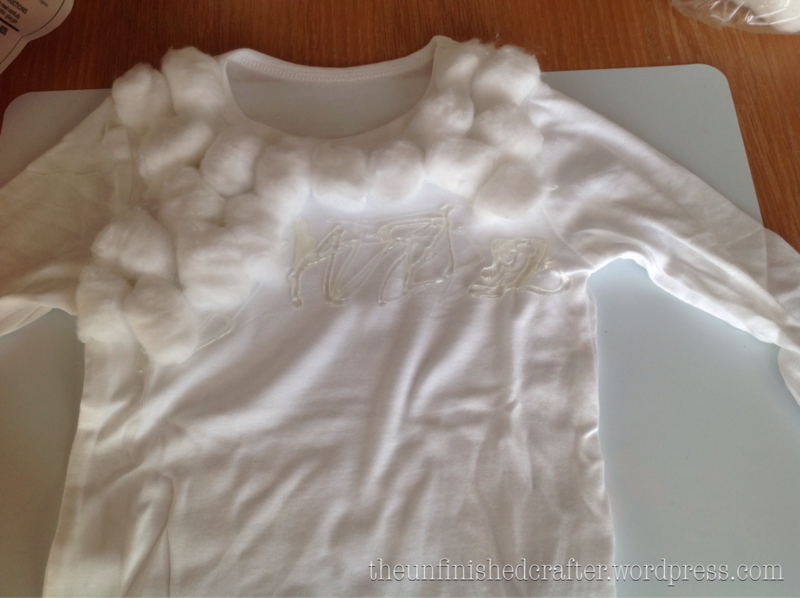 I’d run out of cotton wool at this point, so ending up ripping some bits of leftover wadding into balls (this actually worked much better than the cotton wool and I wished I used it for the top too). Rather than get my sewing machine put, I opted to stick one ear piece in white felt to the corresponding black piece, times two. I stuck the wadding balls to the white circle and stuck the circle to the alice band. I stuck the ears either side of the circle and used extra wadding balls to hide the joins. Little Man doesn’t own any black trousers or long sleeved-tops, so I left the sleeves as they were and put him in an old pair of grey jogging bottoms. 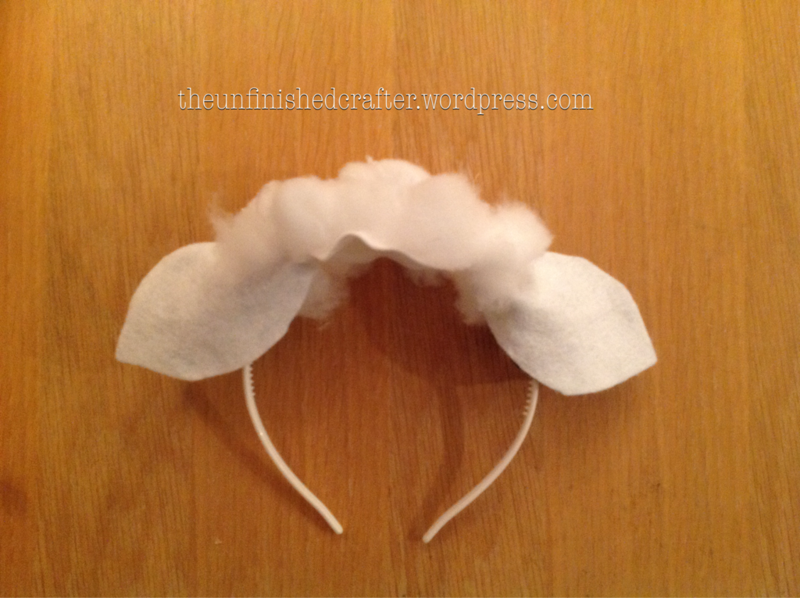 The cotton wool didn’t last long, by the time he made his stage debut, there were a few bald patches! 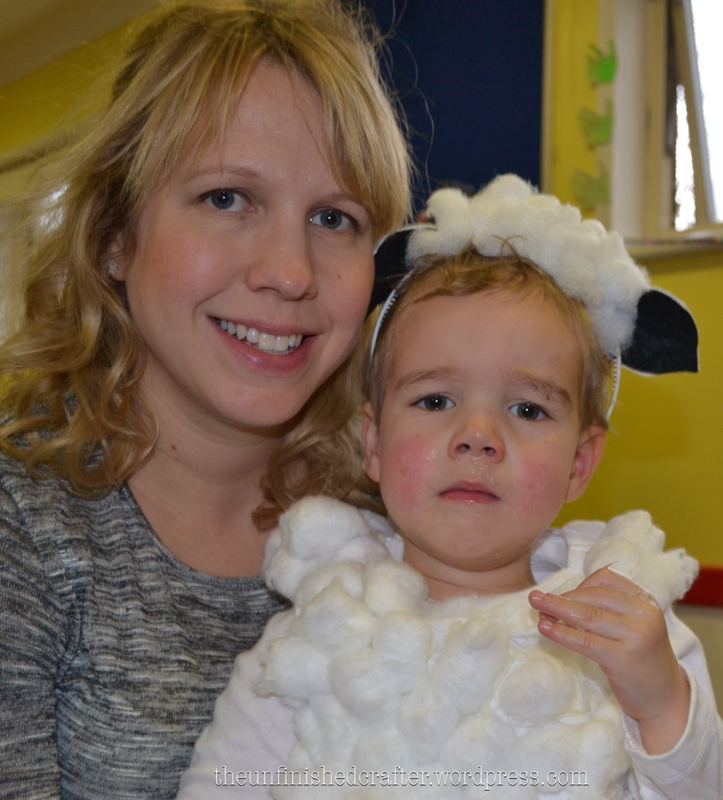 Mummy and her, somewhat unimpressed, little lamb. 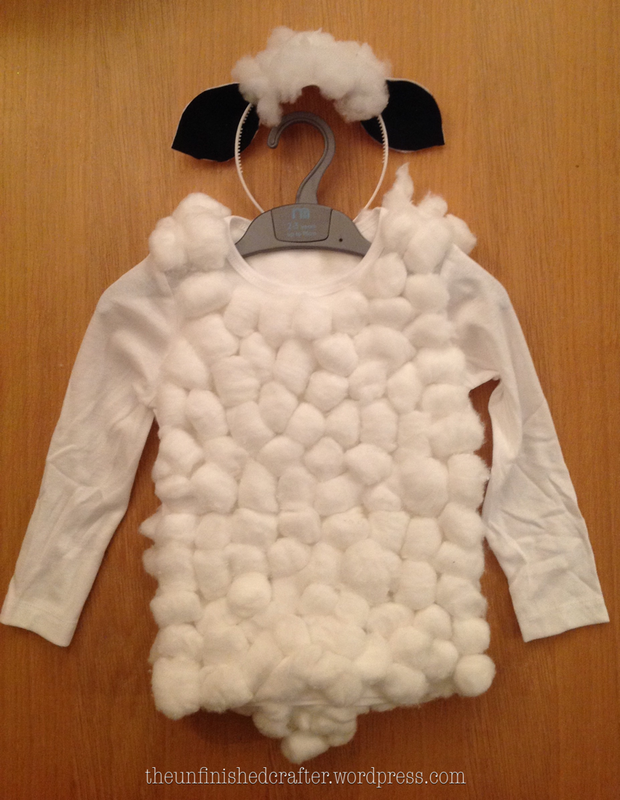 For a more durable costume, it would have been better to sew the cotton wool on. Or, use a fabric glue, perhaps. 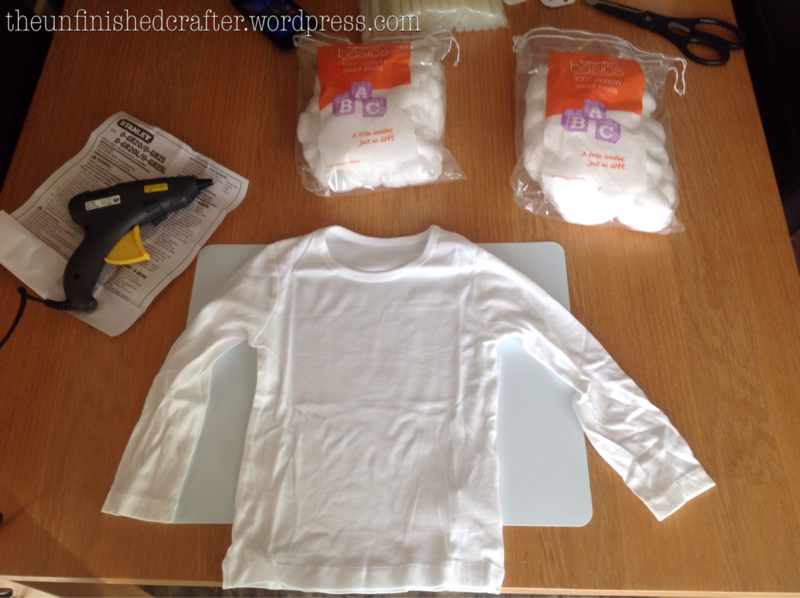 Using wadding scraps is better than using cheap cotton wool. 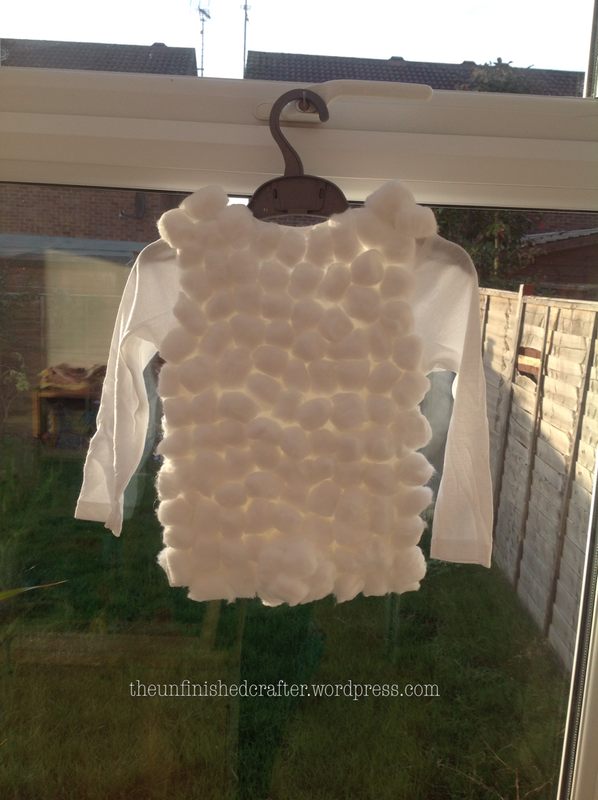 This is a hot outfit to wear and cotton wool gets everywhere! Do you have any costume successes or failures you’d like to share?